Foreign direct investment (FDI) flows rose 130 percent from the 2015 benchmark of $41 billion. Acquisitions drove activity, accounting for 97 percent of FDI value. For the first time since 2013, Chinese investors poured more money into North America ($48 billion, up 189 percent) than Europe ($46 billion, up 90 percent), with the United States accounting for 94 percent of the North American total. This was against a backdrop of global Chinese outbound investment hitting a new high in 2016 of almost $200 billion. Privately-owned Chinese companies led the trend, outpacing investment by state-owned enterprises to close deals accounting for 70 percent of the total, signaling the continued rise of corporate China in the global economy. However, the outlook is mixed as 2016 also saw 30 canceled deals (20 in Europe, 10 in the United States), worth an unprecedented $74 billion. While 2017 is likely to be another strong year as deals reach financial close, the number of newly announced Chinese acquisitions in Europe and North America has dipped since the first half of 2016. 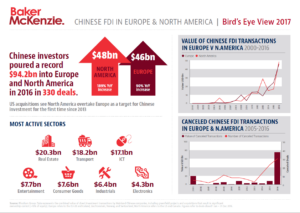 The scale of recent investment, counterbalanced by growing numbers of troubled transactions, in Baker McKenzie’s report with Rhodium Group, which is unique in analyzing patterns of Chinese investment in the two regions’ high-income economies. In Europe, Chinese investors focused on Germany and the UK, which between them saw 46 percent of all investment in Europe. Germany saw inbound deals from China rise nearly tenfold, from $1.3 billion in 2015 to $12.1 billion last year. The UK attracted $9 billion of investment, an increase of 130 percent over 2015. The UK total was driven by deals announced prior to the EU referendum closing in the second half of the year, making it too early to judge the impact of Brexit. Finland, Switzerland, and Ireland were also major recipients of Chinese FDI in 2016, attracting $7.6 billion, $4.8 billion, and $2.9 billion respectively. Switzerland would have been the largest recipient if not for pending regulatory approval delaying the closing of ChemChina’s acquisition of Syngenta. Meanwhile, Italy, Portugal, and France saw investment drop 85 percent, 50 percent, and 40 percent in 2016 as Chinese investors focused on integrating large acquisitions they made in those countries in 2015. The US largely accounted for the increase in North America, with Chinese investments rising by almost 200 percent from 2015 to 2016 to $45.6 billion. Deals into Canada also rose 120 percent, reaching a three-year high. Larger average deal size drove overall value up, with deal volumes stable. With more than $16 billion of deals in 2016, California was the largest US recipient of Chinese capital, reflecting interest in key sectors such as information technology, entertainment, real estate, and logistics. New York was also a major recipient, where real estate investments accounted for 90 percent of value. Several US states saw major investments from China for the first time in 2016, primarily following large individual transactions of companies headquartered in those states. These include Kentucky with more than $9 billion. Investment in Illinois, Minnesota, and Georgia also rose. In Europe, information and communications technology ($13.7 billion), transportation, utilities and infrastructure ($12.2 billion), and industrial machinery ($6.2 billion) saw the most activity. Those three sectors accounted for almost 70 percent of total Chinese investment. It was a record year for IT investment in Europe, outstripping levels of investment in North America which has been historically targeted for IT deals. 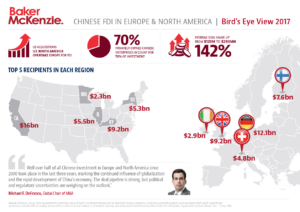 In North America, Chinese investment is spread more evenly across different industries. The main recipients in 2016 were real estate and hospitality ($17.4 billion), transport, utilities and infrastructure ($6.0 billion), consumer products and services ($5.7 billion), and entertainment ($4.8 billion). Together these accounted for nearly 70 percent of Chinese investment in the region. Average deal value more than doubled year-on-year to $290 million across both regions. State-owned enterprises’ share of investment fell to less than 30 percent of total FDI value in 2016 and purely financial investments declined in importance in favor of real economy deals, falling from 53 percent of deal value in North America in 2015 to 29 percent last year as large Chinese corporations made more of the deals. The underlying trend of increased outbound deals by Chinese investors is set to continue as corporate China emerges as a mainstay of global cross-border investment, building in consumer-facing sectors, and diversifying asset bases. Europe and North America are among the most attractive markets for deals in support of these goals. Chinese President Xi Jinping’s strong defense of the benefits of economic integration and free trade at the recent World Economic Forum in Davos indicates continued encouragement for Chinese companies to go global. The number of pending transactions will make 2017 another strong year if they close as expected. These include the $43 billion Syngenta acquisition, which would almost single-handedly set a new record for Chinese FDI in Europe. However, Chinese investment would have been higher in both regions in 2016 if not for the number of cancelled deals also reaching a record 30 deals worth over $74 billion. In Europe, 20 deals involving Chinese investors worth $15.5 billion did not proceed. In North America the figure was 10 deals worth $59 billion. Chinese regulators informally tightened controls on outbound investments in late 2016 as the devaluation of RMB risked some companies taking advantage of outbound investments as a way to move capital out of China. The short-term controls slow down capital outflows, bringing many deals, real estate investments, and some financial transactions under greater scrutiny. Evolving policies may create some approval hurdles and extend project times, but will not change the general direction of China’s overall outbound strategy and policy. Meanwhile, in both North America and Europe, officials have intervened to block several technology acquisitions by Chinese investors due to national security concerns. “While the Committee on Foreign Investment in the United States (CFIUS) has been consistent in its approach, the volume and nature of the deals have produced more challenging transactions, with US officials coordinating with counterparts in other advanced economies,” observed Rod Hunter, a policy and regulatory partner based in Washington. In addition, members of Congress are expected to consider legislative proposals to tighten CFIUS reviews for technology deals and, possibly, to impose new measures to evaluate whether an investor’s country of origin provides reciprocal investment access. “While many Chinese companies have become astute buyers in navigating regulatory procedures such as CFIUS national security reviews, it will become increasingly important for Chinese investors in the United States to develop a political risk assessment and regulatory plan as part of an overall deal strategy,” noted Sylwia Lis, a partner who has represented foreign investors before CFIUS. More generally, the popular backlash against aspects of globalization in the United States and a number of European countries is turning industrial and investment policies towards national economic priorities, potentially complicating large inbound deals. About the author: Baker McKenzie helps clients overcome the challenges of competing in the global economy. They solve complex legal problems across borders and practice areas. Their unique culture, developed over 65 years, enables our 13,000 people to understand local markets and navigate multiple jurisdictions, working together as trusted colleagues and friends to instil confidence in their clients.